The Calderwood Pavilion at the BCA has hosted more than 230 productions for more than 530,000 patrons since it opened in 2004. The Huntington Production Center includes 25,000 square feet of production space for the prop, paint, and scenery shops, 18,000 square feet of storage space for props, costumes, and scenery, and 4,000 square feet of office space. The Huntington Production Center is a well-resourced and modern space where production staff will be able to create and expand upon the renowned production values the Huntington is known for. The Huntington will build upon its community mission by expanding production services to other arts organizations and entertainment venues and companies throughout the region that are in need of high quality services. Everett Independent, August 16, 2017. Ribbon Cutting. Broadway World, August 11, 2017. Huntington Opens New Production Center in Everett. Everett Independent, August 9, 2017. Huntington Theatre Scene Shop Hard at Work on First Production. Everett Independent, April 22, 2017. Moving to Everett: Huntington Theatre Relocates Production Scene Shop to Parkway Area. The Boston Globe, April 13, 2017. Huntington Theatre Company to relocate scenery and prop shops to Everett. July 27, 2017. 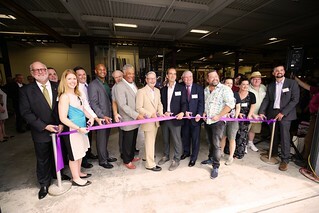 Huntington Theatre Company hosts ribbon cutting ceremony for new production center in Everett. April 13, 2017. Huntington Theatre Company's new shops to be located in Everett, MA starting July 1, 2017.